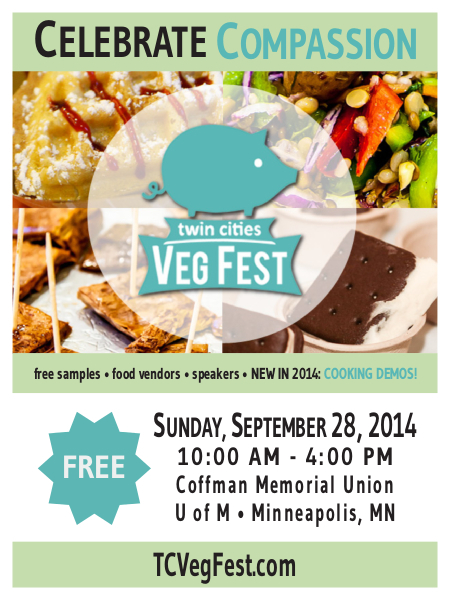 Research Findings: How Effective is Twin Cities Veg Fest for Animal Advocacy? Our mission at Compassionate Action for Animals is to encourage people to embrace their empathy for farmed animals and to move toward a plant-based diet. All of our activities are designed with that goal in mind, and, as we grow as an organization, we look for new ways to assess how our outreach methods are having an effect. Are we actually fulfilling our mission and moving toward our goal of a cultivating a more compassionate community? In 2014, we undertook our biggest initiative for evaluating our methods, and we used our largest annual event, Twin Cities Veg Fest, as a platform to do that. In creating a plan for the research, we consulted with a variety of experts, including Kathryn Asher and Che Green of Faunalytics (formerly Humane Research Council), food scientist Chris Homsey, psychology student Sonal Markanda, and Brandon Whited of Statistics in the Community. We incorporated their ideas into designing a research plan that would help us assess whether the 2014 Twin Cities Veg Fest had an effect on the behavior of attendees. Did the festival inspire them to take action for animals, either by moving further toward a plant-based diet, volunteering, donating, or sharing information about farmed animals? We considered Twin Cities Veg Fest to be the ideal event for the research. 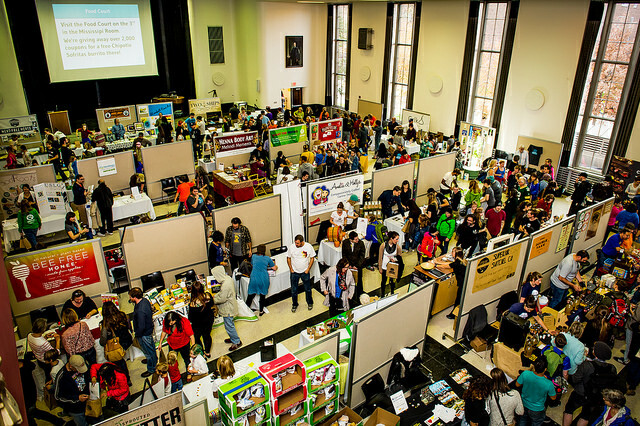 The one-day festival attracts a broad audience and features many of our typical outreach methods, including a vegan food giveaway, speaker presentations, cooking demos, and pay-per-view outreach. The festival also hosts a variety of exhibitors, many of them sharing products and information related to our mission of farmed animal advocacy and compassionate living. 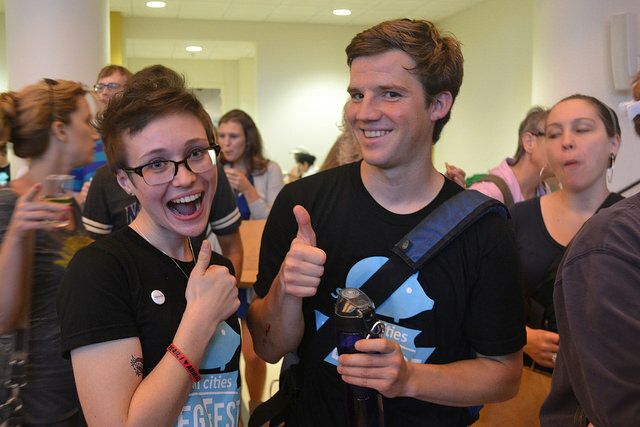 The festival is free to attend and hosted at the University of Minnesota, Twin Cities. While many attendees are university students, the event also attracts the general public and a spectrum of vegans, vegetarians, and omnivores. We estimate that 2,300 people attended the festival in 2014. At the festival, we approached attendees and asked if they would like to participate in a two-part online survey in exchange for a free meal coupon. Chipotle Mexican Grill generously donated coupons for their new vegan option, Sofritas. We had close to 800 people sign up to take the survey. The first survey was sent to attendees in the days following the festival. It asked about their dietary habits in the week leading up to the festival and inquired about other ways they may have action for animals (volunteering, donating, and sharing information). It also asked about which festival activities they experienced. This first survey had 587 respondents. 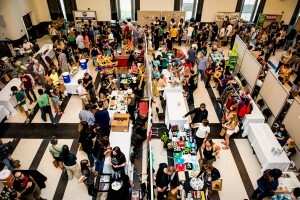 The second survey was sent six weeks after the festival. It asked about their current dietary habits and if participants volunteered, donated, or shared information in the intervening six weeks. It also asked about the most memorable aspects of the festival. 508 respondents completed the second survey and were mailed the Chipotle coupon. The goal of the two-survey approach was to evaluate attendees’ behavior before and after the festival and to see if any changes could be attributed to activities at the festival. Our hope was that we could use information about which events are associated with the most change to aid us in planning future festivals. Statistic in the Community (Statcom) performed two statistical analyses on the data. The first analysis did not fully answer the main questions. The shortcoming of the first analysis is that it was too focused. The second analysis took a broader look at the data and answered the main questions of interest. The results of the second analysis are more general and supported by better evidence, allowing us to disregard the results of the first analysis. Respondents who saw a speaker presentation were slightly inclined to move toward vegetarianism between the first and second survey. Respondents who saw video were inclined to move away from veganism between the first and second survey. There was no evidence for an overall shift in eating behavior. In addition to these findings, Statcom detailed several associations and insights, which can be found in the analysis and appendix of the report. Refer to Statcom’s report for more details on their process and to see a variety of graphs that depict different aspects of the survey findings. Though the survey analyses did not reveal a significant shift in behavior for attendees following the festival, we have learned a lot from this initial effort to evaluate the effectiveness of our work. We realize that behavioral changes are difficult to measure with a survey of this kind. Responses may have been affected by other life circumstances outside of the festival, and without a control group we cannot know the more specific impact of Twin Cities Veg Fest on individuals. 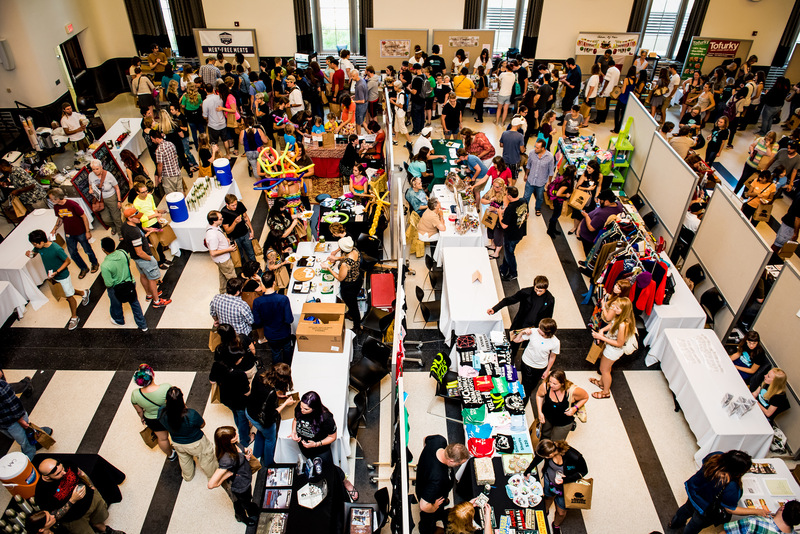 Our sample size was approximately 25 percent of the total number of attendees. While that’s a generous sample size, about 25 percent of respondents described themselves as already vegan in the first survey. We’re more interested in learning about those who describe themselves as vegetarian or omnivore, whether they have been inspired to move further toward a plant-based diet following the festival. In the future, we’d like to make the sample focused on people who aren’t already vegan. We are considering other forms of research that would be more qualitative, perhaps a focus group or one-on-one interviews with individuals who can speak to their experience with various forms of animal advocacy. These survey results do not discourage us from continuing to produce the annual festival; we have received substantial feedback directly from Twin Cities Veg Fest attendees that the festival is motivational to them. Furthermore, as the number of attendees continues to grow, we are assured that the festival is an increasingly popular event that serves a vital purpose for our community. We are very thankful to everyone who helped us with this project, including the experts who offered their guidance, the statisticians at Statcom for carrying out the analysis, the volunteers who recruited respondents, Chipotle Mexican Grill for providing the coupon incentive, and everyone who participated in the surveys and shared information with us. If you would like to support our work advocating for animals in the Twin Cities region, please consider making a year-end donation today. We are committed to seeing that our efforts to speak out on behalf of farmed animals have a real impact, and your contribution will help us to do that.